Articulation and phonological disorders are common forms of speech challenges that children face. Speech therapy techniques depend on the specific type of disorder and sound challenge, and games for kids with articulation disorders or phonological delays can help to bring the fun into the work part of therapy. There are great books to help kids who are struggling with articulation disorders, and the following games can get them moving and learning at the same time. Print this drawing of a fly (one for each target word), cut out each fly, and write words with your target sound on the bodies of the flies. You can get creative and color them, too, or have your kids do those honors. Just be sure the words can be seen. I prefer to laminate my fly cards to help them last longer, but it isn’t a requirement. Next, scatter the flies on the floor with the words visible and give your child a fly-swatter. Have your child Swat that Sound by calling out the word before swatting the fly. You can add a piece of rolled tape to the fly swatter and let your child collect the flies he swats this way (works best if the flies are laminated). You can also skip the flies and just write the target sounds on dry erase boards for faster fun. This is a great group activity to do with a few kids who are working on similar sounds, or even just between siblings who are ready for a boredom buster. Think of it as musical chairs combined with a cake walk (those fundraising events schools hold). Take regular printer paper or cardstock and in large letters print words with your target sounds. Laminate them and tape them word-side-up on a random walking pattern on the floor. Start the music and have the kids walk, using the words as stepping stones along the path. When the music stops the kids say the word on which they are standing. Print these fun fish cards, cut them out, and write words with your target sounds on them. Attach paperclips to their “noses” and place them in a bucket or even a small kiddie pool. 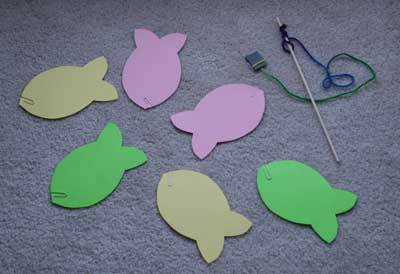 Create a fishing rod from a dowel rod (or even wooden spoon), some string, and a magnet for the hook. Have your child fish for phonics by casting the magnet into the bucket and catching a fish – then recite the word on the fish that is caught. The only supplies you’ll need are flashcards, double-sided tape, a Nerf gun with darts, and a flight of stairs. This idea comes from a creative mom who finds great ways to incorporate play into speech therapy activities. Take the notecards or flashcards with words that have your target sound, such as /sh/, and use double-sided tape to affix them to the stairs in your home. When your child correctly pronounces the word he gets to use the Nerf gun to shoot down the word. Consider it your own Speech Therapy Shooting Gallery! Buy several inexpensive inflatable beach balls like these and on each color quadrant write (with permanent marker) a different target word. Choose a digit – like the thumb of the right hand – to be “it”. Stand either across from your child or in a circle for a group activity and bounce or hit the ball back and forth. When a caller (you) yells STOP, the child catches the ball and calls out the word that the thumb is touching (or of the segment that the thumb is touching). Practice may make perfect in some situations, but the same practice can be boring! Mixing up the games and activities and adding in elements to get kids moving can take the boredom out of practice and put the fun back in your speech therapy session. What kinds of games for kids with articulation disorders do you like to use?